Even so most stuff is fairly easy with node.js, unit testing takes a little bit of getting used to. The main difference to regular unit testing is that just because your test finishes running without an error, it doesn't mean there was no problem. But lets start with the basics. Node.js has adopted the CommonJS assert module specification. You may also find references to mjsunit, but node no longer uses this library. What's important in this test is that we are checking for two things here. The first is the obvious assertion that the web service outputs the content we expect, nothing too exciting here. The second is declaring the variable callbackFired and checking its value in the process 'exit' event. You could get away with not doing it for this particular test, because the test would never finish without the hello.server.close() line getting executed. For more complex tests however, it becomes incredibly important to keep in mind that a callback may never fire, something you can only catch with little helper variables like this. If you need some more inspiration for testing different stuff with node, you should start by going over the test suite that comes with it. TJ Holowaychuk: I wouldn't mind something more descriptive, but I'm very skeptic of using with/eval to create DSLs. 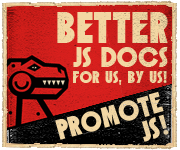 JS is just not that kind of language, and we should embrace that rather than trying to work against it : ).